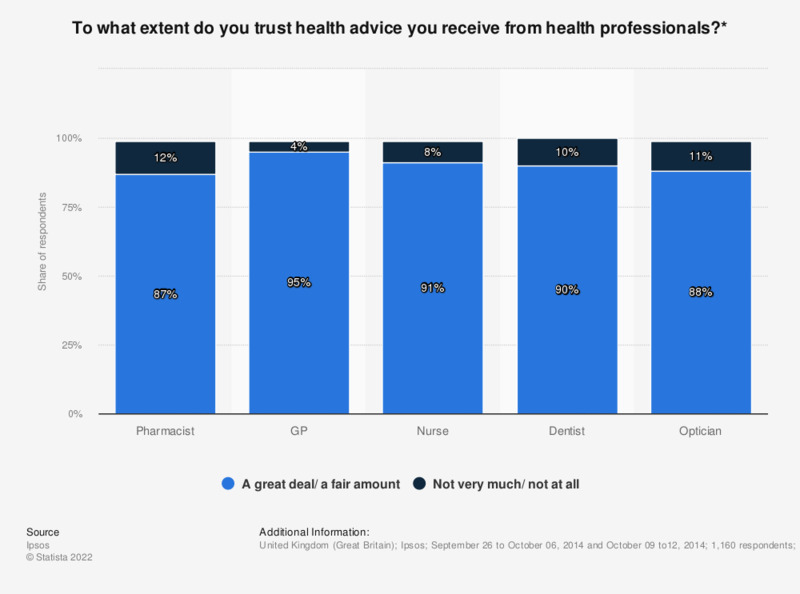 This statistic depicts the extent to which individuals trust the health advice they receive from healthcare professionals in Great Britain in 2014. Of respondents, 95 percent of said they trust their GP a great deal or a fair amount. * The exact formulation of the question: "Thinking about the people you may speak to when seeking health advice. To what extent do you trust health advice you may receive from each of the following people: Pharmacist, GP, Nurse Dentist and Optician." Who or which organisation, if any, would you contact if you wished to get information about flu vaccines? Who, or which organisation, if any, would you contact if you wished to get information about stopping smoking? Who or which organisation, if any, would you contact if you wished to get information about having your blood pressure checked?